Who Do You Write For: Yourself, Readers, or Sponsors? At some point in your blogging career, you’ll probably give some thought to what blog writing topics you should focus on. It’s often a challenge to balance your own desires with the desires of your audience. Today, 2012 BBC Speaker Kimberly Gauthier shares how she approaches this dilemma in her own writing! Choosing what to write about can be stressful for new and veteran bloggers. I’ve read that we should choose a topic that we’re passionate about, write regularly, and write good content. I chose to write about photography only to learn that I now needed to define my blog. Good grief! Who Do You Write For: You, Readers, or Sponsors? What I’ve learned is that when it comes to blog writing topics, I need to write for me first, my followers second, and the affiliates third. Whenever I’ve taken this out of order, you can hear crickets on my blogs. By putting myself first, I get excited about what I’m writing. Whenever I can’t fall into a good writing flow, it’s because I’m putting others first and it’s killing the fun of blogging. These are OUR blogs, OUR sites, OUR words – we should remember that and write what makes us happy and proud. “Me First” is great, but without the audience, the blog fades away on a cloud of frustration. I originally started sharing blogging tips on my photography blog and that didn’t work (crickets), because my followers stop by to learn about photography, not blogging. I work with several brands and I’ve learned to sprinkle affiliate or sponsored links throughout my blog posts, but it only brings in money when I put my followers before the brands. I choose blogging jobs carefully; reviewing products that I believe will interest my followers. I’ve had a few misses, like with a certain prenatal Pilates DVD, but it’s all a learning curve, right? And the DVD served as a great gift for a pregnant friend. But What if You Want to Write About Something Else? My list of first, second, and third is all fine and good, but what if you want to write about something outside your blog topic? I’ve got you covered! Here are three things you can do to start writing outside your niche. Don’t assume your followers won’t be interested. When we adopted two puppies, the followers of my photography blog loved the posts about their progress and now, a year and half later, I still update everyone with cute stories or videos. As long as my blog continues to bring consistent photography related content, my followers won’t bail when I share a cute story about my blog. One of the best things we can do as bloggers is to add as much of US as we feel comfortable to our blog. Give your readers a peak behind the curtain! Submit a guest post to a blog in that niche. I’ve contributed to pet blogs, sharing stories about our dogs and pet photography tips. Not only am I’m having a blast writing about something I love, but I also have an opportunity to expose my blogs to an entirely new set of eyes, and Google loves the back links from the pet blogs. Write for a local paper or newsletter. I recently began writing for The Examiner Online about dogs and dog rescue. I found this gig on the ProBlogger job boards. I also write for a local rescue group’s quarterly newsletter. More new eyes, more back links, and I get to write about something outside my blogs’ topics. Now it’s your turn; what other topics would you like to write about? And if you do write outside your blog’s niche – how do you do it? Kimberly Gauthier started her online adventure in 2009 as an aspiring pet photographer, blogging to promote her business. Two years later, Kimberly has gained a reputation of someone who could deliver tips and tricks on photography and blogging in a fun, down to earth style. I struggle with this sometimes but ultimately try to stay true to myself and my readers. I feel the rest will follow. My problem is that I get excited about a lot of things! It was hard to narrow down my focus. I decided to write two blogs, one for the local newspaper and one for just me. I totally agree Kimberly, whatever it is you are excited about, others will be too. People won’t mind hearing a bit of promotion once in awhile if everything else is awesome. I love your thoughts on writing for yourself first. I get sucked into worrying about whether anyone will care to read what I am interested in or how my blog is different than the millions of other fitness blogs out there when I really should just write what I am interested in and passionate about and let the people decide if they are interested or not! It seems that many people have the same questions and concerns that I have when it comes to fitness and living a healthy lifestyle so when I do research and publish posts centered around my own questions and concerns it speaks to many of the people who read my blog. Thank you! As for writing outside of my niche. I just do it. Occasionally there is something on my mind that I need to get on paper (or computer…ha). When I feel this way I write the post and publish it on my blog but I don’t post it to my FB fan page as I usually would do for one of my niche posts. This way I’m not sending out FB posts to my fans on topics they didn’t sign up for but at the same time it is on my blog so surfers can find it and read it if they are interested. I’m not sure that NOT posting it to FB is the best way. Any thoughts? I write for me. I vent for me. I would like to begin writing about product reviews, which is outside my blog niche. I plan to start a new blog page. My belief is that who you write for depends on why you are blogging in the first place. If you’re blogging to just share your thoughts on a topic, then blogging for yourself first probably works. If you’re blogging to just share what’s going on in your life with your family and friends (which, it seems, is why many people start blogging) then again, writing for yourself is probably going to work. On the other hand, if you are like me and the number one purpose of your blog is to help others, then writing for yourself doesn’t make sense. I started my website/blog to help prospective and veteran homeschoolers find the answers they need to learn how to homeschool effectively. If I write for myself first, I’m wasting my time. I already know how to homeschool. I’ve been doing it for over 20 years. But I know the questions new homeschoolers have. I know the questions those who have been homeschooling for years, who are now going to be homeschooling a high schooler, have and I can give them answers since I’ve homeschooled three kids through high school. I write for my readers because the purpose of my blog is to help my readers. It’s the only reason for my blog’s existence. Does that mean I’m not writing about things that interest me and that I feel passionate about? Obviously not. Truly, homeschooling (and parenthood) is my passion and it comes through in what I write. Yesterday I spoke with a friend that I hadn’t talked to in some time. Even though I don’t think she has ever commented on my site, she says she and her family discuss my posts as part of their devotional times! I had no clue. Just one example of a profound impact my blog is having without me even knowing. I have to believe that story is multiplied over many times, though perhaps in different ways. And that shows me that writing for my readers is accomplishing exactly the purpose for which I write. I’ve been going back to that struggling with writing phase again. My stats have flatlined and there seems to be little interest in my weekly summaries of Project 365. I’m writing it for me but what am I giving my readers? Might need to re-think my approach with a few things. Lovely! I love learning from you all 🙂 This is another great one. Great advice! It can be hard to remember to write what we love first. Me? I just write it. Even if it produces crickets. Even if it’s off topic. Sometimes those get nothing – other times I get a ton of comments. It’s all good. Yes, yes, yes! Great post! Can’t wait to check out your blog. This is a very timely post for me. Lately I have become very self-conscious about my blog. What to write, who to write for. I’ve come to the same conclusion as you, I need to make it fun again, and when I say “fun”, I mean “therapy” which is how my blog started. If I’m not enjoying it, the readers aren’t either. And suprisingly they’re interested in a whole bunch of different topics, as long as I write about them as “me”. I think you need to be yourself, or readers will see through it. I have quite a few interests and manage to blog about them, so I have some variety on my blog. I’ve noticed some posts get more hits, while others are quiet. Guess the cliche is right – you can please some of the people some of the time, but you can’t please all of the people all of the time. I have a wider niche than you do (really I have a not-a-niche) so I don’t feel too constrained in my writing. But there are days when those crickets show up, and no one else. Never fun. I haven’t really branched out into guest posting, but I’m going to start looking into it. That is a great idea! I just recently started a blog and found your advice very helpful. Thanks! Even though I am not a not-a-mommy blogger, every now and again I want to tell a story about my now-grown children. I have done as you have suggested, guest post on “mommy blogs”. This is great because it lets me tell my stories and it draws the niche of traffic I desire for my site, which is moms. Good grief, I am not a mommy blogger! Not sure what I was typing there! Great post!! It’s hard to remember that order we’re supposed to follow — me, readers, sponsors. Thanks for the reminder. Fantastic tips, Kimberly. What you have said resonates within me as what I know to be true: write about what I’m excited about, and it flows. Pay attention to my followers, and what seems to turn them on, and what will provide value for them, and then, when I write a sponsored post, behave with integrity, truthfulness, professionalism, and whenever possible, enthusiasm! Thanks for the tip in regard to considering submitting it to another blog, as a guest post: would never have thought of that, but, why not??? And the link to the ProBlogger job boards is something I will check out. I never even knew there WAS such a thing! Though I don’t take sponsored posts, I will wrestle with what to write, how much to write, things I wish I could write, FOREVER. Great guidelines and so much to think about. I love reading other blogs, but I can’t stand it when they just become a big commercial. Three blogs that I starting following for their creativity, humor and great photos have become nothing but giveaways, sponsored posts, product reviews, and guest bloggers. They have grown their numbers, but their blogs are no longer interesting or fun to read. Now, when I see that that a post is about a product or giveaway, I don’t read it. So I can’t say enough that I totally agree with the point about not writing for your sponsors first. It kills the fun of reading the blog. 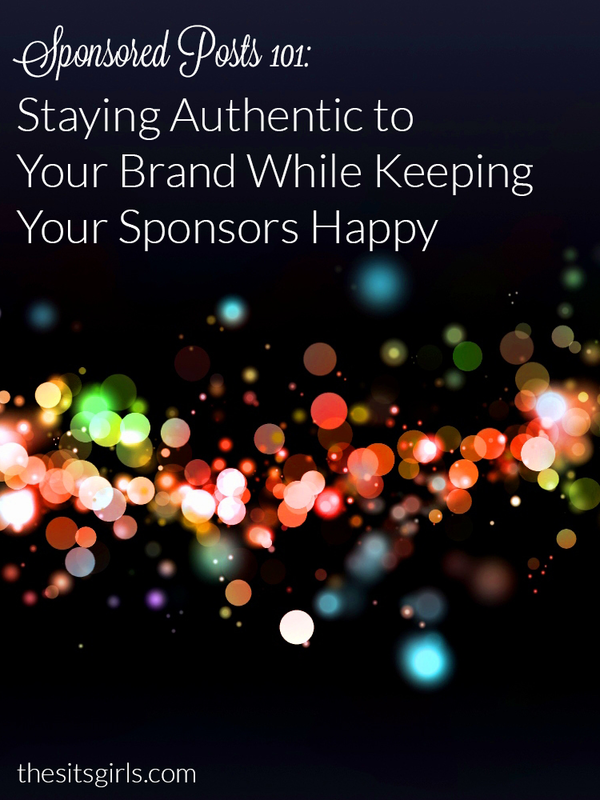 This really is some good food for thought this morning… I tend to write what I’m passionate about and firmly believe that when it comes to sponsors & affiliates, if I don’t believe in it, I won’t write about it. That’s not fair to myself or my readers. Thank you for the advice. I’m actually taking a guest blogging course and we were taught that you should first look at the popular posts on the blog you want to guest post for. You have a better chance of getting your post accepted if you write what the community/readers of that blog already are interested in. Great reminder. I’ve found that when I write topics for my readers that I’m not incredibly passionate about, I don’t get nearly the response and engagement I thought I would. Just today I had a long post about how I blog. And I said that I write for myself first but always have my readers in mind. I wish I had sponsors to worry about! Actually, just this week I was offered a few things and I could do some giveaways or affiliate links but turned both down since they didn’t feel like what I would blog about. This is awesome. Thank you! Great to know we get to ME first somewhere and it’s a great rule. I agree so very much with writing for yourself first. If you write for others first, and what you’re writing doesn’t please YOU, that’ll show in your words because your words will fall flat. I think you’re spot on with all of your advice. It’s tough. I’ve been wrestling with these very issues for months and have not quite figured out how I want to deal with them. At the end of the day, particularly if you aren’t getting paid, you’ve got to write about what inspires you and have fun doing it. Boy did I need this reminder. I have been struggling with this very subject lately. Thank you for a really well thought out post that I plan to reference often. Sometimes I get the order twisted around, and boy does it show through my traffic and lack of comments. Thanks!